PanDigital's 15 Inch Digital Picture Frame | OhGizmo! 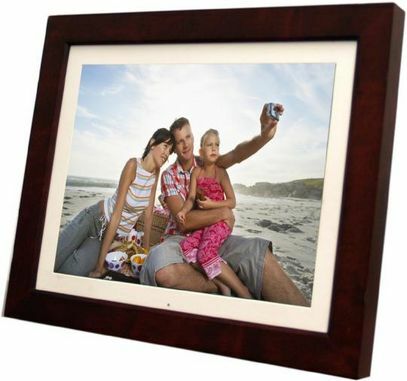 At which point does a digital picture frame become a small LCD screen with a fancy border? We’re thinking that 15 inches is pretty darn close to that zone, so we’re wondering about this latest offering from PanDigital. It’s an everyday digital picture frame, with a 1024×768 resolution and integrated 6-in-1 media reader (SD, XD, Memory Stick, Memory Stick Pro/Memory Stick Duo, Compact Flash, MMC), as well 256MB of internal memory. But it’s pretty big for a picture frame, at 15 inches. Sadly, there are no connections for a PC, though these would of course be unsightly on a wall. It’s $300, which is really quite a bit for something we could technically hack together ourselves for half the price. Sure, it might involve a few holes in the drywall, and endless hours of bickering with the other half over the apparent destruction of her living room, but you should really never pay for something you can do yourself. What’s up with that picture? A photo of a family taking a self-protrait? Very natural. I’ve seen these in person, they are pretty impressive. we are one of the largest esporters of digital photo frame in china ,if you have any demand pleasure let us know ,we will reply to you asap. Thank you !